Events celebrating opening of América Tropical get underway today in downtown L.A.
More than 70 years after a controversial mural painted by one of Mexico’s greatest muralist was exiled from public view by Los Angeles’ elite, outraged by its socially and politically damning content, América Tropical by David Alfaro Siqueiros will soon be on display again for all the world to see, thanks to a partnership between the city of Los Angeles and the Getty Conservation Institute (GCI). Today marks the start of a series of events leading up to the Oct. 9 unveiling of the now conserved América Tropical — the only surviving public mural by Siqueiros in the United States — and the opening of the new América Tropical Interpretation Center (ATIC) at El Pueblo de Los Angeles Historical Monument – Olvera Street – in downtown Los Angeles. Widely acknowledged to be one of the greatest Mexican artists of the 20th century, Siqueiros painted América Tropical in 1932 on the second-story exterior of the Italian Hall on Olvera Street. Its controversial depiction of a Mexican Indian tied to a double cross with an American eagle above him and revolutionary soldiers closing in, led to the artwork being whitewashed within months of its original unveiling on Oct. 9, 1932. “The central visual and symbolic focus of the piece is an Indian peon, representing oppression by U.S. imperialism, is crucified on a double cross capped by an American eagle. A Mayan pyramid in the background is overrun by vegetation, while an armed Peruvian peasant and a Mexican campesino (farmer) sit on a wall in the upper right corner, ready to defend themselves,” according to an article about the mural on the Olvera Street website, www.olvera-street.com. 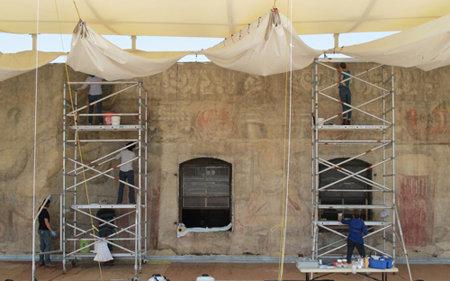 Within months of its painting, the section of the mural visible from Olvera Street … was painted over, and within the decade the entire mural was completely whitewashed, according to the website. The mural was nearly forgotten until the 1960s Chicano mural movement created a renewed interest in the censored artwork. Whitewashing and years of exposure to the elements, however, had severely damaged the mural: sections of the plaster had fallen off; the once vibrant colors had faded. But now, a decades-long collaboration between the Getty and the city of L.A. to conserve, interpret and provide public access to the mural is on the verge of coming to fruition. A $9.95 million public-private investment, $6 million from the city of Los Angeles and $3.95 from the Getty, has paid for research and documentation of the mural’s history and construction of a canopy with sun shades on each side of the mural to protect it from direct sun exposure and rain to prevent further decay. A rooftop platform has also been built to allow for public viewing, according to a Getty Center news release announcing events surrounding the scheduled opening. It’s important to note that América Tropical has been conserved, not restored. Visitors to the site will see what remains of the mural, and not a mural repainted in colors that art historians speculate, but do not know for sure, Siqueiros would have used since there are no color photos of the original mural. Exhibits at the América Tropical Interpretation Center (ATIC), located on the ground floor of the historic Sepulveda House and managed by El Pueblo, explore the history of the mural, techniques used to create and preserve the mural and the legacy of Siqueiros. The mural site will be managed by the city of Los Angeles, with support from the Getty Conservation Institute for monitoring and maintenance of the mural, and from the Amigos de Siqueiros, which will assist with the management of the América Tropical Interpretive Center. September 27, 2012 Copyright © 2012 Eastern Group Publications, Inc.